Learn From Others’ Mistakes—Do Aquarium Care The Right Way! There are many ways to do an aquarium right—thousands of species of fish and invertebrates you can include, countless combinations of plants and coral, and endless possibilities for aquarium design. But there are also definitely ways to do an aquarium wrong. When you’re first starting out, there’s a lot you don’t know. The employees at the stores where you buy your tank and your fish might try to give you a rundown of how to get things going and what aquarium care you need to perform, but they aren’t always all knowledgeable or all in agreement, and can’t include every detail of everything you need to know. So, here are a few common mistakes that many beginners make when starting an aquarium. Learn to avoid them, and your aquarium will be all the better for it. Then, check out our introductory guide to aquarium maintenance to see how to do it right! The first mistake that aquarists commonly make happens before they’ve even gotten home or set an aquarium up. It has to do with the size of the tank they get: it’s too small. Sure, that tank may seem big enough for the fish you’re getting now, but are you thinking ahead to when they grow bigger? Or when you decide you want more fish? Very soon, if not already, your aquarium will start to seem quite small. A good rule of thumb for small community fish is one gallon of water for every inch of adult fish (that means projecting ahead if your fish are young). Bigger fish species, messier species, fish from colder waters, and marine fish have different needs, and will typically require more water. A handy chart can be found here. Cycling the tank should be the first thing you do with your aquarium before you even add any fish, but all too often this process is overlooked or misunderstood. This crucial step in aquarium care is the establishment of a nitrogen cycle. This is the process where ammonia in fish waste is converted by bacteria into nitrites and then nitrate, which builds up in the aquarium until it’s removed in water changes. This good bacteria is essential to breaking down toxic elements in the water and maintaining a healthy environment. That’s why you need to run the aquarium for a few days and use a cycling aid to get the bacteria started before you add any fish. Common beginner mistakes include either skipping this step altogether, or adding ammonia-neutralizing supplements that keep the bacteria from having anything to feed on. Take the time to do cycling right, or you’ll have an uphill battle ahead of you. Just as not all people are cut out for living together, not all fish make good neighbors, and many species definitively do not belong in the same aquarium. Often, they just have different needs in terms of water quality and aquarium conditions, and it’s impossible to create one environment which keeps both of them healthy. Other times, there are behavioral conflicts. Some fish, no matter what, are going to fight, bully, kill, or eat each other. For example, fin-nippers like tiger barbs shouldn’t be mixed with long-finned fish. Managing your populations is a huge part of aquarium care, and so you should do research to make sure a given fish will fit into the water conditions and social environment in your aquarium before you plop it into the water. 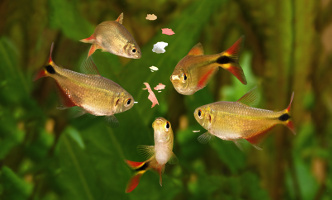 The next aquarium care mistake beginners commonly make is not learning about the diets of their chosen fish. This means both learning about what each species in your tank eats, and feeding them the right amounts of those foods. It’s not enough to figure out which fish of yours are carnivores and which are herbivores. You also need to learn where they eat and how much at a time. For example, if you’re only tossing in fish flakes and letting the fish that swim to the top eat it all up, then you may end up overfeeding those fish while underfeeding the bottom feeders. Not only that, but fish need variety in their diets just like we do. Feeding them one type of food can negatively impact their health, so you need to learn the rhythm of when to change it up with some frozen foods or other treats. As far as aquarium care goes, overcleaning may sound to some like a non-problem, but it really can negatively impact the health of your aquarium. If you’re too thorough about keeping your tank clean, you may be scrubbing and sucking away the good algae that you need for the nitrogen cycle. Your cleaning products including soaps and detergents will also be harmful to the fish and should never be used in an aquarium. The same goes for tap water. 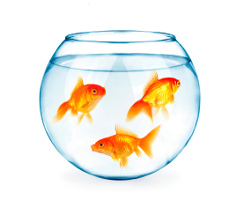 To administer proper aquarium care, you need to learn and stick to what has become accepted best practice. In this case, it may go against your instinct, but let it go—the fish almost certainly don’t mind a bit of algae. Finally, the final mistake that beginner aquarists make. This is a fairly wide-ranging one: not accounting for all the aquarium care they’ll have to do to keep the aquarium going strong. Undercleaning is as much an issue as overcleaning. This means performing regular water changes on a strict schedule. Aquarists recommend a 25% water change every month and smaller 10-20% water changes every week or two for tanks with many inhabitants or large inhabitants. This helps remove waste and pollutants, improve water clarity, and replenish essential minerals and trace elements which your fish need. In addition to water changes, you also need to keep a close eye on the other water quality metrics. This means maintaining stable temperature, pH, water hardness, alkalinity, salinity, and levels of chlorine, chloramine, ammonia, nitrite, and nitrate. These aspects of aquarium care will require you to install and maintain a proper filtration system, as well as testing kits so that you can regularly test the water for those metrics. But buying, installing, and learning to properly use those things can be a lot to take in when you’re a new aquarist eager to get started. That’s when you need a qualified professional helping you through the process. We at Living Art Aquatics have been the experts on aquarium care in Chicago and surrounding areas for twenty years, so give us a call at (847) 737-5151. We’ve been around long enough to see all the mistakes newbies make with aquarium care. With our help, you can avoid them and dive right in!